Those fun lovin' fans in Philly are doing a great job rockin' the vote, with Rollins holding off Hanley Ramirez. 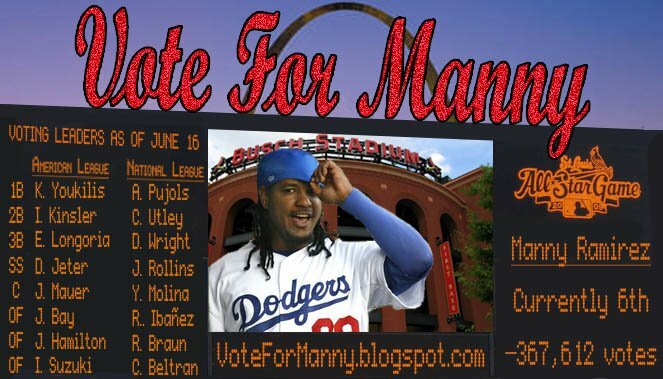 Last week, Manny held a slim 1K vote advantage over the Flyin' Hawaiian Shane Victorino. This week, Victorino passes Manny (bummer) to take hold of 5th place. How Soriano remains in 4th despite quite pedestrian numbers is beyond me. C'mon LA... where's your voting drive? Getting totally outclassed by the East Coasters. Where's your love for your team's players?!?! L.A. has been on the road a lot lately, which has skewed the votes. Also, most L.A. fans are writing in votes for Juan Pierre and Casey Blake, not Manny.